SAN FRANCISCO — The arid Atacama Desert, thought to be a barrier to early South American settlers, may have held lakes large enough to sustain small human populations, according to new research presented here today. The lakes’ presence challenges the current understanding of the paths early settlers took to explore and settle South America, according to the researchers. Marco Pfeiffer and his colleagues scan the arid Atacama Desert, where freshwater lakes and wetlands once provided refuge to South America’s early settlers. Chile’s Atacama Desert spans roughly 1,000 kilometers (600 miles) along South America’s western coast. The desert is sandwiched between two mountain ranges, which prevent water from reaching its valleys and salt flats, making it the world’s driest location outside the poles. Now, new research shows standing water may have existed in the heart of the Atacama. Scientists recently discovered remnants of freshwater plants and animals buried in the sediment of the desert’s salt flats: the large stretches of dry, salty soil that pepper the Atacama Desert. Many of the flats span 600 to 1,000 square meters (6,400 to 10,400 square feet), though some are larger. Radiocarbon analysis showed the freshwater lakes and wetlands existed in the desert between 9,000 and 25,000 years ago, according to the researchers. Despite being one of Earth’s driest places, new research shows the Atacama Desert once held freshwater lakes and wetlands. Many archeologists believe South America’s early settlers traveled from the west coast inland toward the Andean Mountains, avoiding the desert’s dry center by walking along its wetter edges. 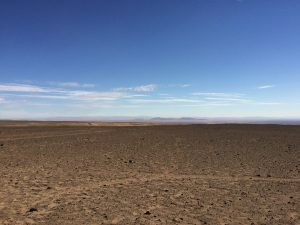 But the new findings suggest the Atacama’s ancient lakes could have provided another path through the desert, and possibly even homes for South American settlers. “The implication is that a landscape previously thought to be uninhabitable was actually an important stepping-stone for colonization of South America,” said Marco Pfeiffer, a soil scientist at the University of California, Berkeley, and lead author of the new study. Pfeiffer will present the study’s results today at the 2016 American Geophysical Union Fall Meeting. When Pfeiffer and his colleagues dug into the salt flats, they discovered organic material left by freshwater plants, snails and microorganisms. Radiocarbon dating suggested those organisms lived after one or more wet climate cycles, known as the Central Andean Pluvial Events. The Atacama Desert is so dry that groundwater evaporates far before reaching the desert’s surface. Pfeiffer said the climate cycles likely brought rain from the Andes down to the water-starved soil of the Atacama Desert, creating the lakes and wetlands. Even populations of guanaco, the undomesticated parent of the modern llama, may have once thrived near the Atacama’s ancient water bodies, he added. When the climate cycles ended, the lakes and wetlands transitioned from fresh to saltwater before completely disappearing several thousand years later, Pfeiffer said. The researcher, Marco Pfeiffer, will be available to answer questions from members of the news media during a media availability from 8:30 – 9:00 a.m. PT today in the Press Conference Room, Moscone West, Room 3000. The media availability will also be streamed live over the web. Information about how to stream press conferences can be found here. The researchers will present a poster about their work on Thursday, 15 December 2016 at the AGU Fall Meeting. Time: 1:40 – 6:00 p.m.
CSLDF and AGU symposium on law and science: The Climate Science Legal Defense Fund and AGU are hosting a symposium to discuss the legal issues facing scientists under open records Laws from 8:30 a.m. – 12:30 p.m. at the Marriott Marquis San Francisco, Salon 2. Press registered for the AGU Fall Meeting are invited to attend, but must RSVP in advance to AGU Public Affairs Manager Elizabeth Landau at elandau@agu.org. You must be registered as press for the AGU Fall Meeting to attend. California Governor Jerry Brown will deliver a Special Lecture from 9:30 – 10:00 a.m. in Moscone North, Hall E.
Special post-election session: The shifting landscape for science: The recent election of U.S. President-elect Donald Trump and new members of Congress have introduced new uncertainties in terms of the strength of federal support for scientific investment, trust in scientific integrity, and the level of support for educating and developing the next generation of scientists. AGU will host a special session with Katharine Hayhoe, Associate Professor in the Department of Political Science and Director of the Climate Science Center at Texas Tech University; and Daniel Kammen, Director of the Renewable and Appropriate Energy Laboratory (RAEL), Professor in the Energy and Resources Group Energy and Resources Group (ERG), and Professor of Public Policy at the Goldman School of Public Policy at University of California, Berkeley. There will also be a Q&A moderated by AGU president Eric Davidson. The special session, which will explore ways AGU can work with and provide support to scientists during this period of uncertainty, will take place from 10:20 – 11:20 a.m. in Moscone North, Hall E.
Sally Jewell, U.S. Secretary of the Interior, will deliver a Special Lecture from 12:30 – 1:30 p.m. in Moscone North, Hall E. A media availability will be held immediately following the lecture in the Press Conference Room, Moscone West, Room 3000. The post-election session and Governor Brown’s and Sally Jewell’s Special Lectures will be streamed live on AGU On-Demand. Registered journalists who are interested in attending these events should meet an AGU staff member at the entrance to the lecture hall 30 minutes prior to the start of the talk. Press should meet in front of the doors to the right of the escalators: When you are at the bottom, facing the escalators, the doors are to the right of the escalators. When you are coming down the escalator, turn left at the bottom of the escalators. The role of the subtropical North Atlantic water cycle in the 2015 extreme precipitation events in the U.S.
AGU journal editors recommend these sessions happening today, tomorrow, and Friday.